In New Iberia, Louisiana, Catholicism is king. The city, established in the late 18th century and located just north of the Gulf Coast, found itself home to two different populations united by a common religion. Catholics from Andalusia, Spain, settled there after arriving in nearby Bayou Teche and named the city Nueva Iberia in honor of the peninsula from which they emigrated. Thousands of Acadians, French-Catholics from Canada’s Maritime Provinces, also inhabited New Iberia during a southward migration after a British-ordered expulsion. In the early years of the 19th century, these two groups built an active economy in New Iberia based on shipping goods that arrived at Bayou Teche via New Orleans to other towns in the region. While Jews never constituted a large percentage of New Iberia’s population, their arrival in the 1870s changed the city’s religious, economic, and social climate. One of the first Jews to arrive in New Iberia was Jacob Davis. Davis, who emigrated from Poland, opened a dry goods store in the downtown area and soon emerged as one of the most prominent citizens of the city. He fostered excellent relationships between the growing population of Jews and the city’s native Catholics. When the Catholic community of New Iberia sought to raise money for the construction of a church in 1888, Davis contributed $500, the largest donation of anyone, regardless of religion. Davis’ generosity was indicative of the close relationship Jews enjoyed with Gentiles in New Iberia. In addition to the Davis family, several other Jewish families arrived in New Iberia in the 1870s and helped to develop this expanding city. In 1871, Lazard Wormser settled in Jeanerette, a small community ten miles southeast of New Iberia, after emigrating from Alsace. He opened a small general store in downtown Jeanerette. He was soon joined by other members of the Wormser family, who later established branches of Wormser’s Department Store in downtown New Iberia and Franklin. Another Alsatian, Maurice Weil, came to New Iberia around 1870 and worked as a clerk in a local general store. One of his sons, Sam Weil, became the longtime assistant postmaster of Iberia Parish. A. Lehman and Co. was the largest department store in New Iberia in 1876. Several other families, including Weiss, Eiseman, and Kling, arrived in New Iberia within the decade and operated small merchandise stores in the area. By 1885, 14 Jewish families had made their homes in New Iberia and the surrounding area and had begun to congregate as a Jewish community. Several years beforehand, an unknown Jew brought a Torah to New Iberia, which was kept in the Masonic Hall where a small group of Jews prayed together on the High Holidays. Joseph Wise, who would become the first lay leader at the temple, led the services. In 1897, this group of Jews that had been praying together at the Masonic Hall on Rosh Hashanah and Yom Kippur, organized Gates of Prayer and planned for the construction of a brick synagogue at the corner of Charles and Weeks streets in downtown New Iberia. This new congregation, under the leadership of Wise, Joseph Dreyfus, and Leopold Levy, strived to build the most beautiful temple possible and thus asked the larger Catholic community for financial support. “Now, when there have been churches to build, to repair or money needed by the Christians for churches or charity,” a press release in the Weekly Iberian read, “it mattered not what sect was asking help, our Jewish citizens have always promptly and liberally aided. The time now comes when we can reciprocate. The time comes when we can show our gratitude for past aid and we should gladly embrace it.” This appeal proved wildly successful. In addition, the women of the congregation founded a Sisterhood called the “Daughters of Israel” that raised $1,000 from within the Jewish community towards the building of the temple. 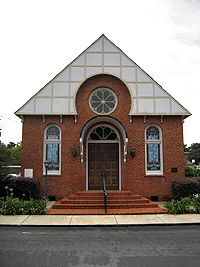 Construction of the temple concluded in 1904, at which time a dedication ceremony took place under the spiritual leadership of Rabbi Julian Miller, a student rabbi at Hebrew Union College. Many non-Jews attended this “very attractive program,” which featured keynote addresses by Jews and non-Jews alike. Fifty years later, Rabbi Miller traveled to New Iberia once more and donated his services for the 50th anniversary of the temple’s dedication. Gates of Prayer flourished in the early and mid-20th century as membership increased and the Sisterhood carried out significant initiatives. In 1913, the congregation purchased land for a cemetery; prior to this, New Iberia Jews were buried in either New Orleans or Lafayette. In its first year of existence, only ten families belonged to the congregation and a few students were confirmed by Rabbi Max Heller, the longtime rabbi at Temple Sinai in New Orleans. Soon thereafter, members of the Daughters of Israel organized a small religious school and a choir. This devoted group changed the name of their organization in 1913 to the Gates of Prayer Sisterhood and signed on as a charter member of the National Federation of Temple Sisterhoods. In later years, members of the Sisterhood played an integral role in the development of both the local synagogue and the Jewish community. They sold thousands of dollars in war bonds during World War II and helped to form Sisterhoods in other Louisiana regional centers such as Thibodeaux, Houma, and Opelousas. In 1959, the Sisterhood financed the construction of a non-sectarian chapel in the New Iberia Parish Hospital and one year later purchased a new organ for the temple’s sanctuary. 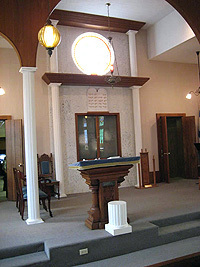 Twenty-six congregants established the B’nai B’rith Evangeline Lodge in 1939; there had been an earlier short-lived B’nai B’rith chapter in the late 19th century. Membership in the lodge remained strong for the next several decades. By the 1960s, the B’nai B’rith had reached its peak in membership. Questions of religious leadership have often concerned Gates of Prayer’s congregants. Many small congregations in the areas realized early on that by pooling their resources they could attract quality rabbinical leadership. As early as 1905, tentative plans called for “a circuit rabbi officiating in New Iberia, Lafourche, Crowley, and Opelousas.” While many rabbis from throughout Louisiana have visited the congregation, Gates of Prayer has never had the services of a full-time rabbi, with two fleeting exceptions. In 1933 and 1934, Gates of Prayer shared a rabbi with Rodeph Shalom in nearby Lafayette. In 1962, Gates of Prayer again entered into a rabbinical partnership with another nearby city. Rabbi Leslie Sirtes served both New Iberia as well as Temple Shaare Zedek in Morgan City, 50 miles southeast on Highway 90. Rabbi Sirtes only stayed for one year. During the extensive periods when Gates of Prayer has not had a full-time rabbi, they have had a student rabbi from Hebrew Union College. Today, a student rabbi comes once a month to lead services. Over the years, they have also relied on lay members to lead services. Outside of the temple, members of New Iberia’s Jewish community continued to make an impact on the larger society. The rise of the Louisiana Gulf Coast’s oil industry in the early 20th century presented new economic opportunities for Jewish merchants in New Iberia. Alphonse Davis, who operated the Davis’ family furniture store, invested significantly in the New Iberia Oil Company, a lucrative start-up in 1916 that pioneered drilling in Iberia Parish. Lazard Kling, one of New Iberia’s earliest Jews, also invested in this company after serving as a dry goods merchant and president of The People’s Bank. In later years of his life, Kling became president of Iberia Savings and Loan. Alfred Lewald, who operated a large department store in downtown New Iberia, founded Enterprise Oil Company. Several other members of the Jewish community assumed occupations in industries not typically influenced by Jews. Lester Kahn acted as superintendent at the local sugar mill. Leon Dreyfus, an Alsatian immigrant and the president of Gates of Prayer for its first quarter-century, operated a hardware business that supplied local mills. In addition, Dreyfus served as president of the New Iberia and Development Company, which managed irrigating canals, cotton gins, a cotton oil mill, a rice mill, and a syrup mill. Julius Scharff purchased the Elks Theater in 1919 and introduced movies into the establishment, which had before only put on theatrical productions and road shows. Under Scharff’s management, the theater became the premier movie house in the region, showing the latest movies starring Mary Pickford and Charlie Chaplin. One member of the Jewish community even involved himself in state politics. Jules Dreyfus, who had served as a merchant, banker, and a rice mill operator, served on a small committee in 1916 to settle a famous dispute between the Town of New Iberia and Southern Pacific Railroad over plans for a municipal streetcar system. In 1920, Iberia Parish elected Dreyfus to the Louisiana State House of Representatives, where he served until his death in 1926. While Jewish merchants once dominated the main street of downtown New Iberia, only one Jewish-operated retail business remains. The last group of such stores to exist in the area included Creim’s women’s clothing and accessories store, the Davis furniture store, Kahn’s pharmacy, the Lewald family specialty store, and Steinberg’s furrier. Nowadays, few Jews engage in retail merchandising. Instead, Jews in New Iberia and the surrounding area are often doctors, lawyers and professors at the University of Louisiana in nearby Lafayette. Wormser’s, which closed several years ago, was one of the last Jewish-owned stores in town, though the building and its sign still remain. 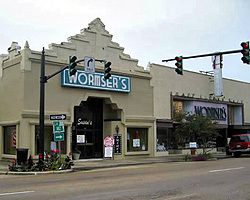 John Wormser still owns Wormser's Men's Store in New Iberia, which is the last retail outpost of the Wormser family, whose stores once proliferated throughout Acadiana. While the Jewish population of New Iberia has shrunk in recent decades, the Jewish community continues to persevere. Gates of Prayer, which added a social hall and classrooms to its building in 1950, has experienced a membership decline from 50 families at the time of the addition to 25 families today. Of the current members of the congregation, approximately one-third is of the Lahasky family. Polish immigrants Morris and Frieda Lahasky lived in New Orleans and had two sons. While other children of immigrants grew up speaking Yiddish with their parents, both Morris and Frieda were deaf and, in turn, their two sons grew up using sign language at home. Bernard and Jacob Lahasky both attended medical school and settled in New Iberia in the 1950s to raise their families and offer their services as family doctors. Their sons have also become doctors in town as the Lahasky family has been caring for the health of New Iberians for over 50 years. In remembrance of his parents, Jacob has treated many deaf patients in the area at no cost. In recent years, the Lahasky family has served as the glue holding the congregation together. Bernard, Jacob, Stephen and Robert Lahasky have all served as presidents of the congregation and have coordinated United Jewish Appeal fundraising drives. According to Jacob Lahasky, some of the biggest donors to the United Jewish Appeal in New Iberia have been non-Jews. Other families belonging to the congregation, many of which were charter members, come to weekly Shabbat services and Sunday school from the surrounding communities of Kaplan, Abbeville, Jeanerette, and Franklin. Despite these challenges, the Jewish community of New Iberia continues to thrive. A student rabbi from Hebrew Union College serves the congregation once a month and on the High Holidays. When Hurricane Rita destroyed part of southern Louisiana in September 2005, the temple marshaled its resources to assist with the purchase and distribution of medications for evacuee families. The Sisterhood still hosts social events that gather Jews as well as the larger community. Each year, the Sisterhood plans a wildly popular corned beef luncheon and many non-Jews lend a helping hand in the making of the sandwiches. The sandwiches, which sell out in advance every year, have Jews and non-Jews lining up around the temple for a taste of this Jewish specialty which can be otherwise hard to find in Cajun Country. The larger, Christian community in New Iberia has embraced their Jewish counterparts with open arms and the Jews have reciprocated. New Iberia Jews have struck a delicate balance between retaining their unique religious identity and incorporating themselves into the broader life of the community. In the years to come, Gates of Prayer will continue to serve as a communal place where Jews from throughout Acadiana can come to celebrate and grieve, teach and learn, and pray and socialize together.